Callisto is a Bear boss found south of the Domonic Ruins within the deep wilderness. 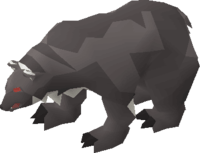 As Callisto is a Bear, Callisto kills will count towards a Bear slayer task. Callisto is a boss often farmed for a chance at the Dragon Pickaxe or the Tyrannical Ring. He also has a few more worthwhile drops, like 100 noted Toadflax. The most common tactic to use at Callisto is full Veracs as Callisto has extremely high melee defences. The Verac’s set effect gives you a 25% chance of ignoring this high defence – combine this with the fact that you can protect the full set by utilising the Protect Item prayer, and Veracs makes a perfect armour choice for this boss. The overall strategy for the Callisto fight is pretty simple when utilising Veracs. You want to use the Protection from Melee prayer in order to protect yourself from Callisto’s powerful melee attacks. Callisto has a knockback attack which you can mitigate by positioning yourself with a tree behind you. You simply then just have to keep your health high and be on the lookout for PKers as you finish the kill.